The Moses Kotane Institute (MKI) is pleased to announce that it has appointed Mr Siza Sibande as its Chief Executive Officer (CEO). Mr Sibande joins MKI from the Okhahlamba Local Municipality in Bergville where he held the position of Municipal Manager. 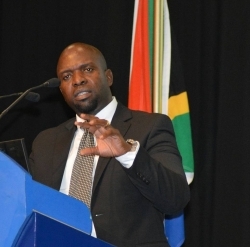 He takes over from the outgoing Acting Chief Executive Officer Mr Ranveer Persad who has resumed his duties as the Chief Director for Local Economic Development (LED) at the KwaZulu-Natal Department of Economic Development, Tourism and Environmental Affairs (EDTEA). Member of the Executive Council (MEC) for EDTEA, Mr Sihle Zikalala has welcomed the appointment of Mr Sibande as the new CEO for MKI. "I believe that with his experience, Mr Sibande is a well-resourced person to guide the MKI and ensure that it fulfils its mandate to develop skills in the Science, Technology, Engineering and Mathematics (STEM) that is sufficient and appropriate to service the economic growth and development need s of the province, while also incorporating good governance," MEC Zikalala said. MKI Chairperson of the Board, Dr Sakhile Ngcobo also expressed his satisfaction with the appointment of Mr Sibande, "We hope and trust that he will be given all the necessary support that will allow him to perform well in his portfolio. His positions in the past make him a well-rounded Executive who is best placed to lead MKI into the future. We look forward to working with him and wish him all the best in his new role," he said. The new CEO said; "I am passionate about the Development of young people, and of South Africa at large. I believe that with my experience and the support of the Board, staff and external stakeholders, we will be able to achieve more in the development of historically disadvantaged young people particularly in KZN to enhance the economy." Mr Sibande hold to his credits the following qualifications: Masters in Business Administration (MBA) from the University of Stellenbosch Business School in 2013, a Bachelors of Technology (BTech) Degree in Management from the Durban University of Technology (DUT) in 2008, A Certificate in Management Development for Municipal Finance from the University of the Witwatersrand (Wits) Business School in 2009, a Certificate in Project Management from Damelin College in 2016 and a Bachelor of Administration (BA) Degree in Education obtained from Vista University in 1995. The Moses Kotane Institute is an entity of the KwaZulu-Natal Provincial Government through the Department of Economic Development, Tourism and Environmental Affairs (EDTEA). Its mandate is to provide an internationally recognised quality research driving the economic development and innovation in the province. It does this by providing timely and accurate research to support the attainment of radically transformed, inclusive and sustainable economic growth for the province in partnerships with public and private sector. It is also funded mainly by EDTEA and other stakeholders.